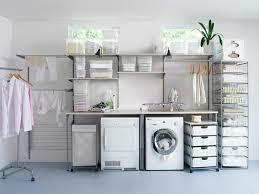 Laundry rooms can leave a lot to be desired. Sometimes dark and dingy, often relegated to the deep corners of an unfinished basement where bare concrete block walls and cold concrete floors are to be expected, they can be less than inviting spaces. 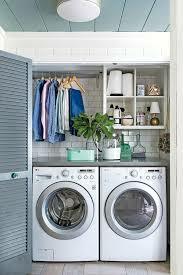 And since doing laundry can become an almost daily event, having a welcoming, organized area to complete the chore in can quickly become important. Ready to brighten up your laundry area and make it a place you no longer dread visiting? There are a few things you can do to get yourself started. First, decide what functions you need the room needs to serve. Storage? Mudroom? Or will it be strictly a place to wash and dry clothing? Next comes the hard part, formulating a plan. 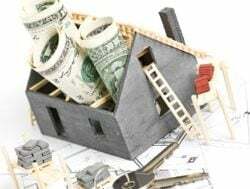 If your remodel will require bigger jobs such as installing insulation, hanging drywall or electrical work, consider hiring a contractor. Got someone pretty handy in the family? Even better! Completing as much work as possible on your own will obviously help keep the budget under control. What comes next? 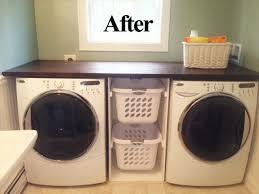 If you have room in the budget, purchasing a high-efficiency washer and dryer can prove very beneficial. Capacity and efficiency, compared to older model machines, are vastly improved and can save you both time and money in the long run. I know this first hand after breaking down and purchasing a new set earlier this year. The washer can handle larger loads than our old machine and both washing and drying time are drastically reduced, using less hydro and cutting down on our monthly bill. 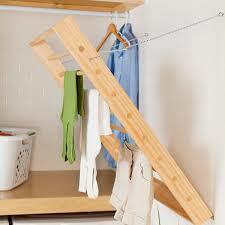 Leaving a space for hang-to-dry items can also be a big help. During warm weather we use a laundry line in the back yard but when it’s rainy or cold, that can be counter-productive. Use a small, foldable laundry rack that can set up in a corner when needed and tucked in between the machines when not in use. If you want to go all out, a custom hanging rack can be installed, improving functionality and keeping clothes in one place. Where does your laundry get folded? Having a large surface on which to sort and fold clean clothes makes it easier to organize clean clothes before they gets put away. One easy way to do this is to install a length of wood or counter just above the surface of your washing machine and dryer. This does not have to be expensive and can yield you as much as eight feet of usable counter space. Just make sure to leave enough space around the machines to allow for proper ventilation. 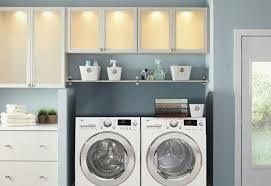 If you’ve got the extra space, a laundry room is a great spot to incorporate storage. Give some thought to what you need to store and you’ll quickly realize what size and type of containers you’ll need to get the job done. Inexpensive shelving units can be purchased at department stores and many today are intended to hold cubbies or bins as well as loose items. Larger items such as winter gear, sports equipment and bulky coats or jackets may require sizable bins which can be stacked, while smaller items like hats, mittens or miscellaneous items can be tossed in smaller individual bins where they won’t get lost. I’ve been in some homes where each family member has a basket or bin where stray items can be deposited. 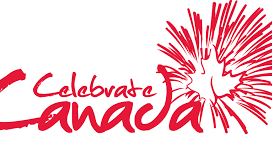 Then once a week, or whenever necessary, everyone puts away the items that have collected in their container. Not a bad system!